Scandal at California event venue. Nudist resort accused of indentured servitude. Furry events there were “Fox Hunts” (human role-play) and possibly a dance or two. There’s no other connection worth reading. But furries don’t ruin everything, do they? Regular people can be WAY worse. Furry Music video: Dance Furpocalyptic (Furpocalypse 2015). Buddy: the “Apple Watch” for dogs. Could humans wear this collar as a style thing? Look at the programmable LED’s and built in tech, and imagine possible applications. Costume tech, a light show on your collar, games, choreography… I sent an overture to the company in case they wanted some press, and imagined them laughing about people wearing dog stuff. 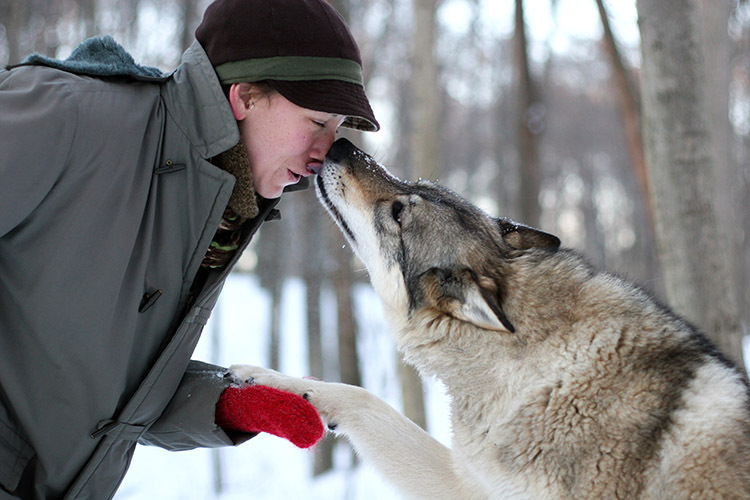 Wolf Sanctuary In Norway Lets You Cuddle Wolves While Watching The Northern Lights. I can’t add anything cooler. Furry Science Ethics: Should Human Stem Cells Be Used To Make Partly Human Chimeras? A bioethics debate and a funding moratorium. MAKE magazine: Amazing rideable dragons and elephants. La Machine Brings Over the Top Mechanical Theater to the Streets. Ceramic Arts Daily posted “Creating Expressive Features In Animal Sculptures”. Just a small excerpt from Narrative Animal Sculpture book, which I’m sharing because ceramic sculpture is a special art apart from the usual furry experience. Animals have long been used as symbols in storytelling all around the world, and visual artists have been using animal figures in artwork for just as long… Lisa Naples shares her insights and techniques on sculpting animals in clay to tell stories… (and) her insights on how to play with ideas and incorporate symbolism and meaning into your work. Prestigious artist Laurie Anderson makes memoir documentary about her dog. “Heart of a Dog” features Lolabelle (a rat terrier), Ms. Anderson, her late husband Lou Reed, surveillance and drone footage, and hand drawn animation. It sounds like a treat. I’m curious because I know her as a contemporary of 1980’s avant-pop musicians like the Talking Heads. She did multimedia concerts and the left-field chart topping song “O Superman”. It’s a hypnotic electronic lullaby that sounds like nothing else. But her art background is much deeper than that. Furry photographer Tom Broadbent’s blog update. A Tale of Two Photo Salons. Super Collies dance their hearts out! AMAZING FURRY NEWS COMING SOON – Wait Until You See What The Babyfurs Did In #6!